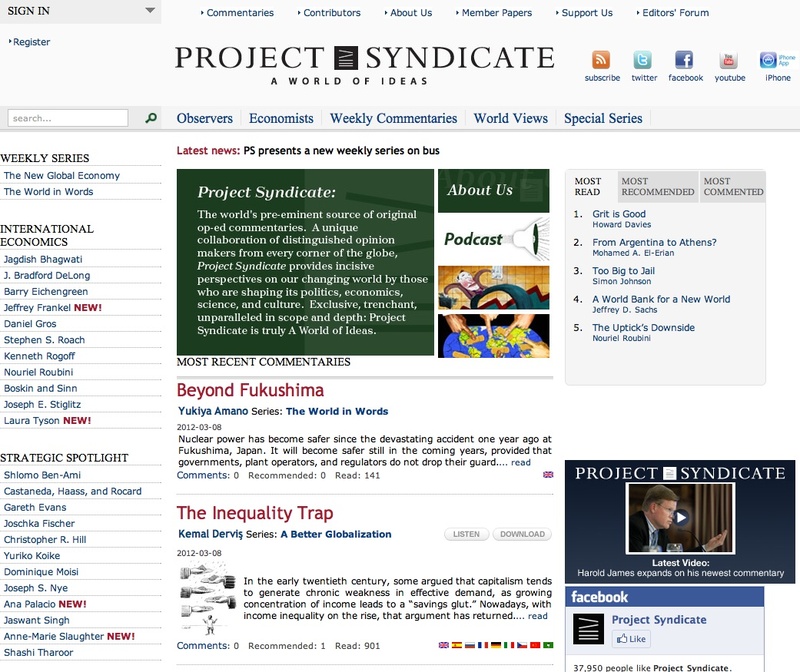 Project Syndicate, a non-profit organization, is an international association of around 260 newspapers in more than 110 countries providing hundreds of articles and commentaries on current political, economic as well as social and international issues and hot topics, written by prominent figures in the world’s foremost newspapers, including politicians, novelists, academics, and activists. The website provides twenty monthly series and one weekly series of articles on topics ranging from economics and international affairs to science and philosophy. Records are classified by topics and date of publication, annotated and translated from their original versions in several languages. All kinds of users are allowed to access all articles and material for free and browse through detailed directories. Yet, downloading options are quite limited: users are only allowed to save webpages, or use printer-friendly versions. The linking structure is well developed, providing the direct links to member newspapers’websites. Updating frequency is on a weekly or monthly basis according to the publication series. Although few navigational supports are provided, the website presents no problems of orientation thanks to its clear content organization. refer to online access to newspapers, magazines, wire services and electronic media. Thousands of worldwide newspapers, magazines, journals, financial data, public and legislative records are accessible via these databanks websites. LexisNexis, the most comprehensive full-text media sources databank is a pay-per-service website accessible from many academic libraries via an institutional subscription.